CEDEX is well positioning to be a lucrative investment opportunity in the financial market. As the first ever Certified Blockchain based diamond exchange, CEDEX is aiming to revolutionize the way diamonds are bought and sold on the market and, in turn, create an entirely new asset class which is accessible to the public. The recent partnership between CEDEX and IDEX (International Diamond Exchange) is a move to cement CEDEX’s technological innovations. IDEX already boasts more than two decades of an indisputable reputation as a market leader in the global diamond industry. Both CEDEX and IDEX look set to gain from this partnership. By advising each other on the methodology behind the market, as well as mutually sharing inventory and diamond suppliers’ data, liquidity in the CEDEX market from the first day of trading can be ensured. IDEX presence in the professional diamond trading market is impressive with more than 7,000 professional traders utilizing their system regularly. A massive 75% of the supply chain inventory is already featured on their system. With the diamond market now opening up to a broader trading audience, IDEX and its professional users can secure the stability of the market while CEDEX and its new investors can grow the value of the market as a whole. The team behind CEDEX boast a dazzling selection of specialists across many disciplines, including technology, finance and diamond trading. Together they have created the world’s first transparent and secure public trading platform for diamonds set to revolutionize the diamond exchange market, starting with the launch of the CEDEX Coin by way of a Token Based ICO Pre-Sale on the 12th January 2018. Financial investment can appear to be a daunting task, especially when exploring a new asset class. Diamonds Markets have long suffered from a lack of transparency and unless you are an expert in the field of diamonds, it can be near impossible to know the true value of a stone. 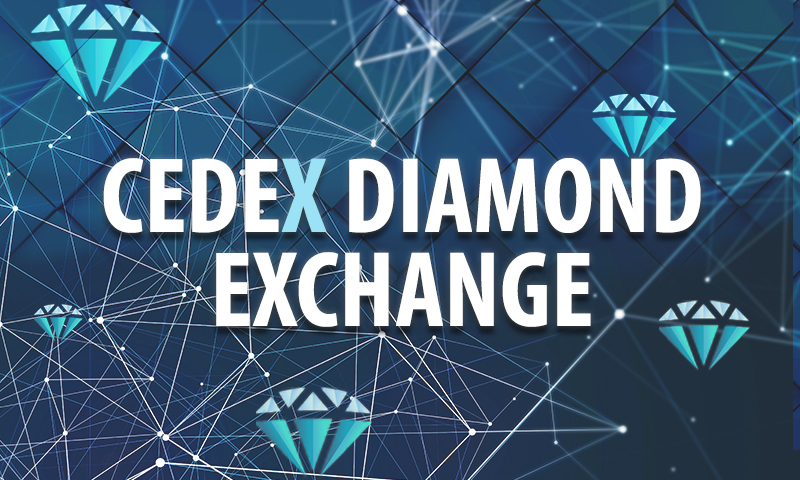 The CEDEX Exchange will overcome this challenge thanks to its machine learning algorithm, DEX, that rates a diamond’s asking price and creates transparency on the value of any stone listed on the Exchange. This will effectively give any trader the confidence to buy and sell diamonds without the need for years of research and knowledge on the diamond market. Thus through CEDEX, anyone can invest in individual diamonds, shares on a basket of diamonds (EFT) or a share in a single high-value stone without fear. Only CEDEX Coins can be used for transactions within the exchange. CEDEX coins will however be listed on major currency exchanges, enabling simple conversion to either other cryptocurrencies or fiat currencies. An earlier supporter of CEDEX has been Techfinancial who recognised the potential in CEDEX and became a 90% majority shareholder of the company. Techfinancial is a public company traded on the London Stock Exchange. In addition to providing financial support to CEDEX, TechFinancial will also assist with resources, workforce and experience that they have available to grow the enterprise. IDEX is the current leader in online diamond trading platforms for professional diamond traders that are located main diamond cities globally. Since 2004 IDEX has published its IDEX Diamond Index; the first and oldest running index on the planet that is based on actual listing data. IDEX is also the first Ethereum based, decentralized smart contract exchange to support real-time trading and high transaction throughput. There are currently over 650,000 diamonds registered on the IDEX Online diamond trading platform, allowing users to identify the best deal to suit their needs. Post diamonds, search for diamonds and list buy requests are all functions available through the IDEX platform. In addition, IDEX features complete supplier details and fully scanned certificates and diamond images which allows for complete peace of mind when making purchases. One of IDEX’s strongest draw points is the Guaranteed Diamond Transactions™ (GDT™) which allows for the secure purchase of authenticated polished diamonds with immediate delivery, at a low fixed fee using their fully automated online trading service. GDT™ comes with guaranteed availability and delivery of stones to buyers, as well as a guaranteed cash payment to sellers. Currently, this GDT™ service is available in main global diamond centers in Europe, the US, Australia, Singapore, Thailand, the UAE and will continue to expand to match the demand of the market. CEDEX is a rarity among I.C.O’s: Not only is its roadmap ahead teeming with investment potential, but it is owned by a publicly traded company and partnered with the industry leader in its field. With the slew of I.C.O’s on offer, it makes sense that people looking to invest source out those with a proven track record of integrity and which are endorsed by unimpeachable sources. CEDEX stands alone in those categories. For those looking to invest in diamonds or hedge against currencies or stocks, there is finally a viable method. Details of the upcoming I.C.O can be found at www.cedex.com.